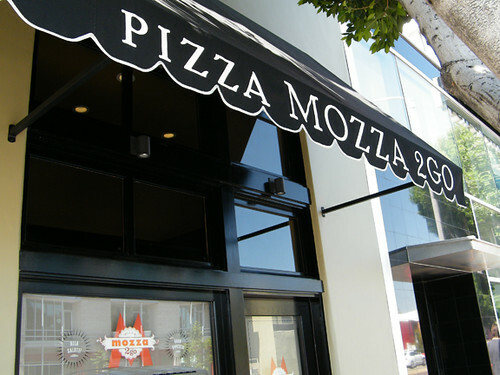 Since our very first visit to Pizzeria Mozza (Christmas Eve 2006), Peter and I have continuously wished for two things: That Mozza would offer a Pizza-to-go / Delivery service, and that Nancy Silverton would make a pizza with chicken liver, guanciale and burrata. If you love Mozza’s Chicken Liver Bruschetta, then you’d understand how amazing this dream pie could be. Peter had Friday off from work, and up to that moment, we had no actual plans for the 3rd of July. 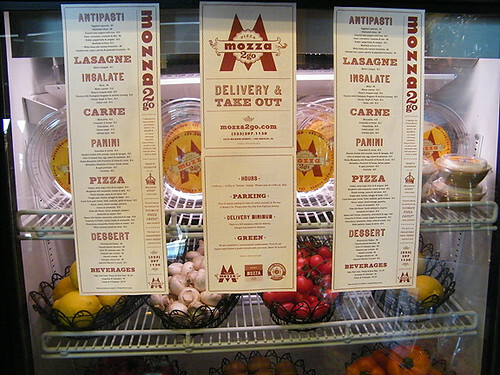 I searched online to find an opening time for Mozza 2Go, but the closest thing to actual hours listed (at that time) was an Eater LA article stating that, “the first order accepted at noon and the last order at 11:00 pm”. Thinking there would be a line around the block (hey, it’s Mozza after all! ), I told Peter we should plan on getting there by 10:30 AM. I figured we could order a pie, eat it there and then do some shopping at the Grove afterwards. There’s a Mac Store at the Grove… and Peter was obsessed about getting his new iPhone. All I wanted was to check out the new Mozza 2Go. It was a “win win” situation for sure. By 10:45 am, the only people visible at Mozza 2Go were locksmiths working on the doors to the Scuola di Pizza (Pizza School) next door. 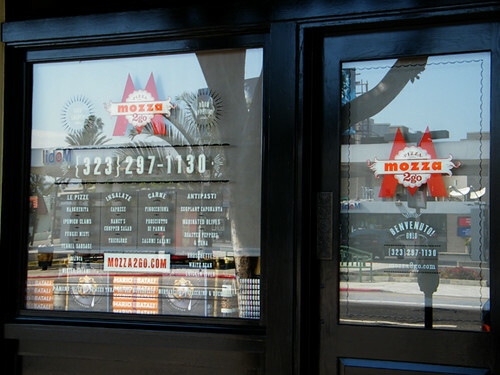 I took several photographs of the exterior and called the Mozza 2Go phone number. The lovely voice on the recording noted that they were open Tuesday through Sunday, and that the phone lines opened at 11:00 am, with the first order availalable at noon. The message also said to check the Mozza2Go.com website for more details, but as of that morning (Friday July 3rd), the site was not yet online (Peter kept checking with his old iPhone). So, we waited. “Mozza Groupies”, just the two of us. I kept calling the number and got the same recording… over and over again. At 11:30, we (meaning Peter) decided we should drive to the Grove and come back afterwards. My iPhone-obsessed husband traipsed off to the Mac store, while I impatiently shopped at World Market and Sur La Table (both stores are near the parking lot). At about one o’clock we finally got back in the car (Peter flying high from his 3Gs iPhone purchase), and drove back to Highland and Melrose. The sidewalk was still empty, but Mozza 2Go was finally OPEN! Yes, some wishes do come true! No crowds yet, just us and another couple waiting to order pizza. For some reason (hunger?) I thought we could order a pizza and have the choice of either eating there or taking it home, but of course it’s called “Mozza 2Go”! After a quick look around (they sell the chicken liver AND the Budino to go! 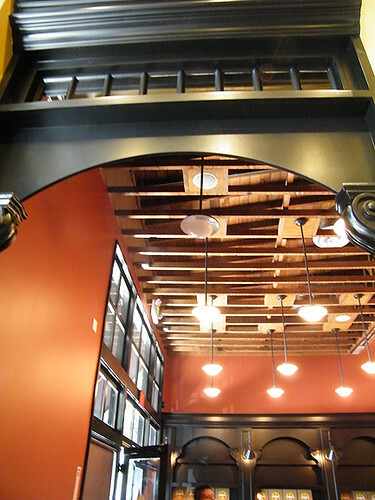 ), we decided to try to get a table at Pizzeria Mozza around the corner. Having skipped breakfast, we were both, by then, famished and a little cranky (at least I was, Peter was playing with his shiny new toy). During the end of our lunch at Pizzeria Mozza (photos & link below), Peter called Mozza 2GO and ordered a Fennel Sausage Pizza for us to pick up afterwards. 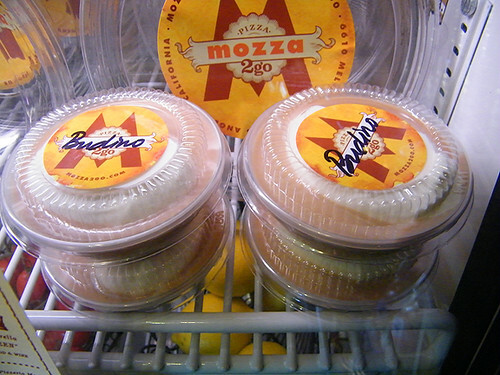 We figured we may as well try the 2Go service since we were there, and heck… we never get sick of Mozza! 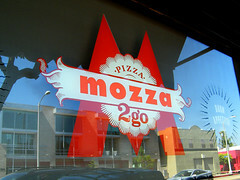 When we got back to Mozza 2Go, I was curious about the Pizza School next door. “Where do I sign up?” was the first question out of my mouth, but it turns out it’s for private events only, with a max of 45 “students” per class. 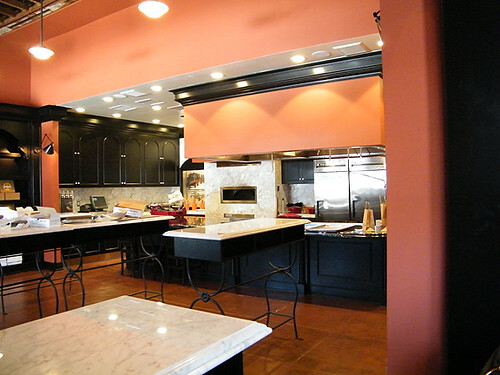 A press release was recently sent out that noted, “In addition to pizza training the Scuola will be home to a variety of cooking demos, wine tastings and other culinary exploits”. I asked about the cost for a private pizza class (with 44 of my nearest and dearest), but no one had any answers yet. My birthday isn’t until March, so there’s plenty of time for Peter to sort that out. 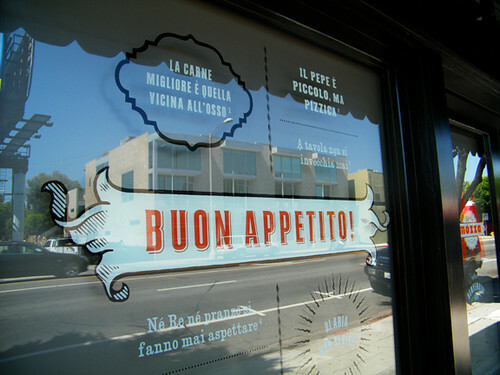 Scuola di Pizza front window (to the left of Mozza 2Go). 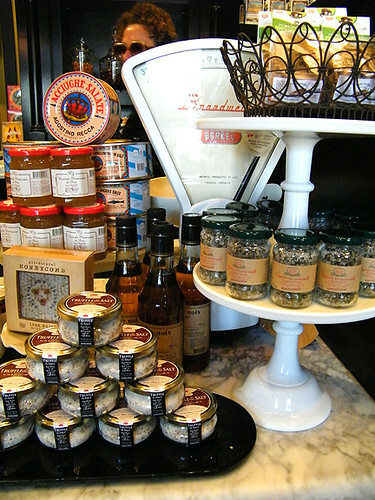 That’s Butterscotch Budino on the top right shelf! Butterscotch Budino to GO! 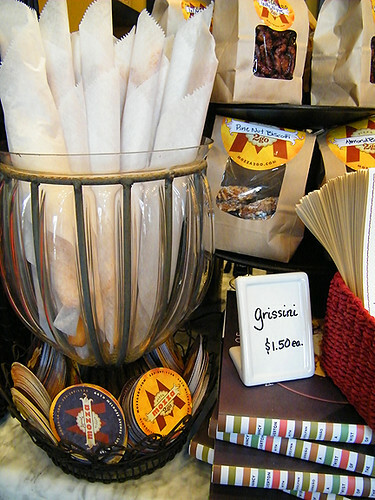 Make sure you get the Rosemary Pinenut Cookie with it. 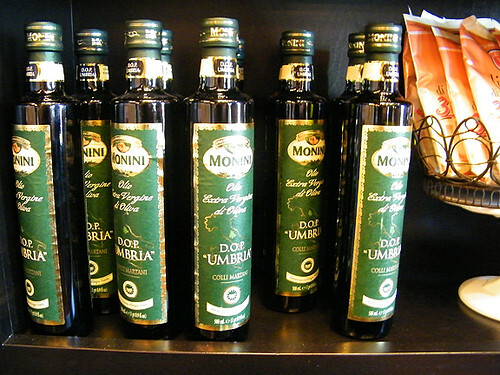 Monini Olive Oil used in the Mozza kitchens. (Nancy participates in this olive oil coop in Italy). Peter paying for our treats. Scuola di Pizza (Pizza School) next to Mozza 2Go. Looking from Mozza 2Go into Scuola di Pizza. 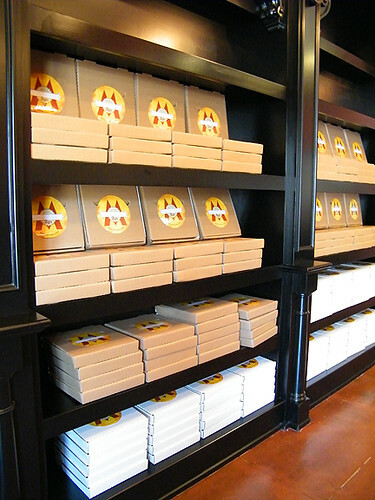 Pizza boxes on the shelves at Scuola di Pizza. Our pizza (Fennel Sausage, Panna, Red Onion $15) outside of Mozza 2Go. 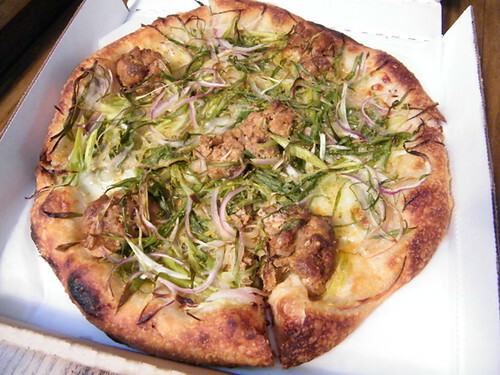 Fennel Sausage, Panna, Red Onion Mozza 2Go Pizza – PERFECT at home! 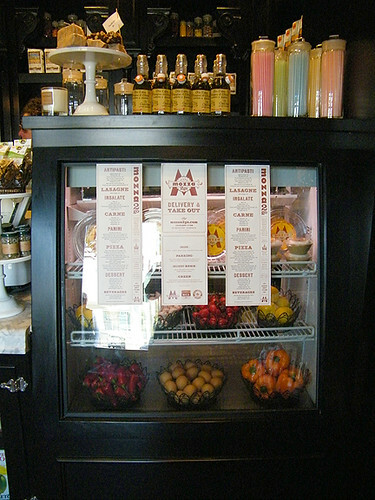 Free 15 minute parking for take out orders available behind Mozza 2 Go. Well if I know anyone who can drum up 45 friends for a private pizza making lesson, it’s you. If and when that happens, I’m sure it’ll be a day to remember for sure. Thanks for the in-depth review of “Mozza 2 Go.” The pizza looks delicious, and the store front is first class all the way. 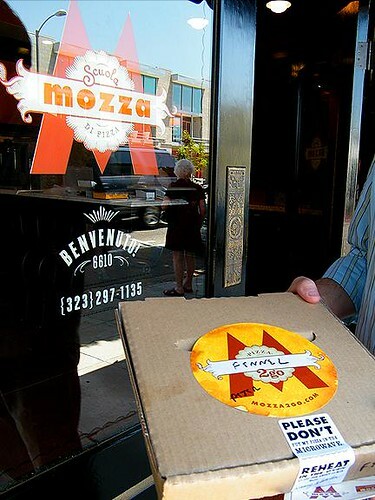 I love the sticker on the box that reads “Don’t put my pizza in the microwave! 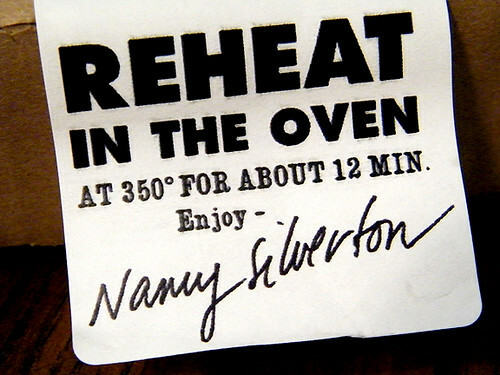 Reheat in the oven.” Amen to that! Americans take note. And don’t over sauce my pasta either. Oh yes, I saved that sticker. It’s proudly displayed in my kitchen! Love this! LOVE it! Great post, great pix! I wanna go to pizza making school!!! Sounds like you guys had a lot of fun. Can’t wait to check it out – probably this weekend! I can’t WAIT for Pizza School! MARATHON EATING DAY! W-OW…..I WOULD LOVE THAT!!!!! We’ll have to buy matching “eating skirts” LOL! I think we were there at the same time or, at the very least, missed each other by minutes! I too thought the line would be around the block so when I drove by and it wasn’t, it was necessary to pop in. I was thrilled to see Nicholas (former LaBrea Bakery guru) and I did get the chicken liver crostini! I wasn’t aware that Nick was from LaBrea Bakery! He was so nice, answering all my “groupie” questions. Yeah, Nicholas used to be the manager @ the Bakery when I met him (along w/ George @ LBB). 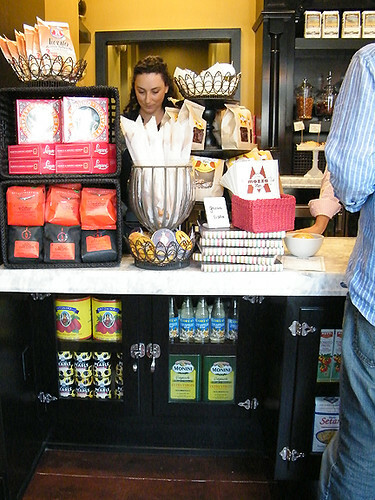 Then he left to do some other things, worked w/ Grand Orange for a bit, was behind the cheese bar @ Mozza Osteria and then when I popped in that day, there he was. He’s a sweetheart, so good to see him. I’m drooling a little bit just thinking about it. I think the only thing which may keep me from myself is that the clam pie isn’t on the 2go menu! Thanks for the details! And oh YES, the Ipswich clam pizza! 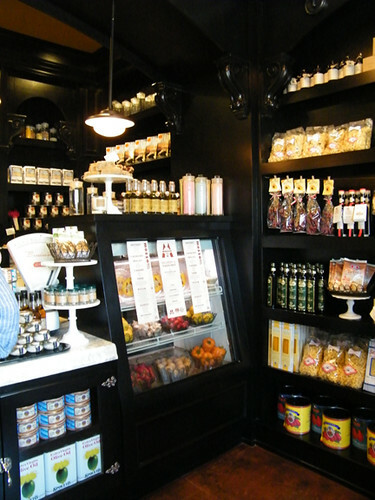 The store looks gorgeous inside and out. And I’m glad to read that the pizza tasted just as great at home. Awesome addition to our city’s food scene, for sure! Okay, I haven’t had breakfast, and the sweet oatmeal I am planning on isn’t going to be as good as that fennel pizza looks. OMG. Thanks for the info, now I want to go to Pizza Scuola. Now, now now. Not later. I know! I was ready to start class THAT MINUTE! I actually never ever heard of pizza mozza living out in the boon docks but now I might have to fly out there just for a slice! looks really tasty! I just made my 1st visit: Coach Farm goat cheese, leeks, scallions, garlic & bacon pizza for me (yum!) and Margherita with mozzarella, tomato & basil for Robert. Just like at Pizzeria Mozza they were great.